Sediment Removal for Marinas | GeoForm International Inc.
Of all the commercial marine interests impacted by the regular accumulation of sand, silt and debris — otherwise known as sedimentation — perhaps none are so adversely affected as marinas. Due to the very nature of public and private marinas that supply safe havens for mariners to moor, dock and launch their boats, the passageways of marinas need to be kept free and clear of obstacles and debris at all times. However, since marinas are typically located in calmer, quieter spots that offer boats heightened protection from exposure to rough winds and pounding waves, they’re also often places where water currents slow down. As a result, they deposit the sediment and debris they carry with them. 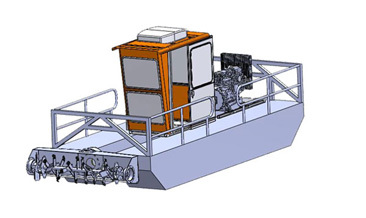 A marina dredge is often the best solution to effectively remove accumulated sediment. Yet depending on the severity of the sedimentation, the type of dredge employed and the method of disposal of the dredge spoils, a marina may or may not have to close during the dredging operation. This difference can have a significant economic impact on a marina and the companies that depend on its normal operation, such as charter boat and commercial vessel operators. When marina dredging is required, the equipment and method chosen for these crucial maintenance operations are vitally important to the safe passage of vessels, but also to the ongoing financial welfare of a facility and its clients. In addition to the potential impact of dredging on a marina’s operations, many larger dredges and excavators can pose problems for delicate shorelines and the wellbeing of aquatic life in the immediate area. All things considered, if the disruption to a marina is too great, the results of using the wrong type of dredge can have long-lasting negative consequences. 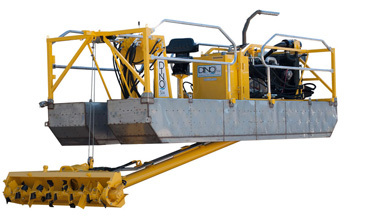 Fortunately, the Dino6 Sediment Removal System is a highly portable yet powerful dredge that can outperform dredges twice its weight and size. Designed to work in tight spaces around other equipment and obstacles, it’s the perfect choice for all types of marina dredging. Portability: At 22 feet long and six feet wide, with a total weight of only 3800 pounds and a mere 14-inch draft, the Dino6 is an extremely portable unit. Its footprint is a fraction of what many other dredges require to operate. Accessibility: Since you can transport it with one trailer and a haul vehicle, you can mobilize, launch and recover the Dino6 with minimal effort involved. Also, thanks to its compact size, you can easily maneuver it into boat slips, as well as around docks and moorings of all sizes. Capabilities: Don’t let its light weight and small size fool you. The Dino6 is a powerful machine, featuring a 1500 gpm pumping rate and a high-torque, direct-drive cutter head. The unit delivers dredging rates of 1100 gpm over 800 feet horizontally, so it works effectively, regardless of whether you’re pumping spoils to a nearby shoreline, filling geotextile tubes or pumping directly to a barge for later disposal. 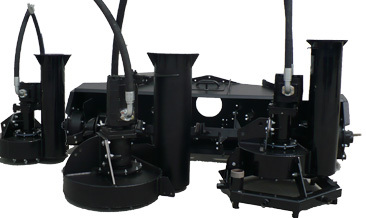 Since 1998, the team at GeoForm International Inc. has been designing and manufacturing industry-leading pumps and dredges. We’re confident in the performance of every Dino6 we build because we know the quality we put into it. For the very best in customer service and equipment recommendations, contact us today. We’re dedicated to being your marina dredging expert.